The Turkish state broadcaster, TRT, has broadcast a Kurdish-language programme for the first time. Legislation allowing Kurdish broadcasts was passed two years ago, but TRT is the first major broadcaster to do so. The move follows decades during which the use of Kurdish was banned, publications were proscribed and broadcasters prosecuted. The broadcasting of Kurdish is among the European Union's demands as Turkey tries to gain a date for entry talks. 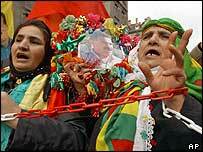 The Kurdish programmes will amount to around 35 minutes of broadcasting twice a week. On Wednesday, the half-hour television programme, called "Our cultural riches," began with news and continued with a mix of Kurdish music and documentaries on nature, the development of civilisation and technology. The BBC's Jonny Dymond in Istanbul says that, given that the Turkish republic is founded on the idea of ethnic homogeneity, the introduction of Kurdish programmes is little short of revolutionary. Given the ready availability of Kurdish language broadcasting on satellite television, it is unlikely that TRT's limited offering will attract a large following, but the symbolism is immense, he says. TRT started broadcasts in non-Turkish languages on Monday, including an Arabic programme. The station will also broadcast in a Circassian dialect once a week. "It is the symbolism which is terribly important"